Severe drought, insect infestation and poor forest management have combined in recent years to kill millions of trees in the American West—130 million in California alone—and provide fuel for huge wildfires. The crisis is all the more alarming as hundreds of millions of hectares of land were scorched this summer out west in several states, causing a dozen or so deaths. Last Thursday, for instance, the government agency in charge of overseeing firefighting in forests said no fewer than 71 wildfires were burning. And things could get worse. Early this year experts warned of the risk of a new, potentially much more dangerous kind of forest fire. They blame the rampant mortality of trees, mainly conifers, which has ravaged forests as a result of drought and beetle infestation. In the Sierra Nevada mountains of California, some forests have lost 90 percent of their trees, prompting authorities to declare a state of emergency. As for the link between tree deaths and the rise in forest fires, the factors at play are complex and sometimes deceiving, said Brandon Collins, a researcher who has co-authored a book on the issue. "The simplest sort of interpretation is that having dead trees just means that you have a lot more dry fuel for fires. You might expect fires to burn more intensely, quickly," Collins told AFP. 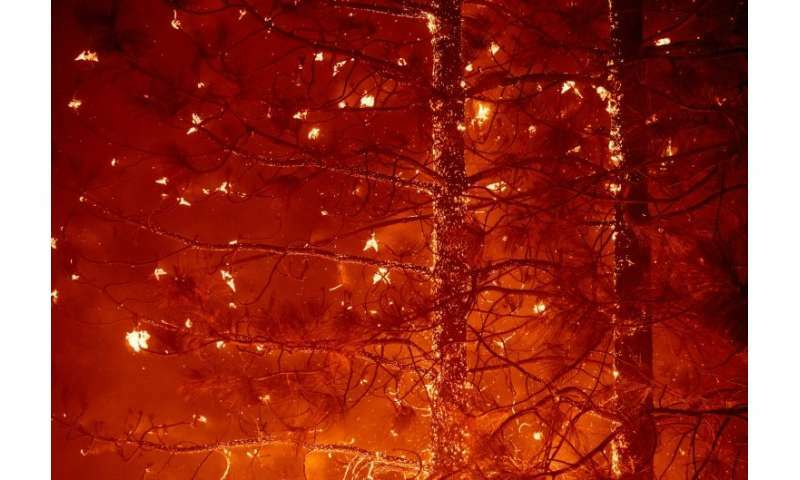 But the nature and behavior of these fires does not fundamentally change, said Collins, who is a researcher with the US Forest Service and the University of California at Berkeley. Over time, the needles from dead trees fall to the ground, denying "fuel continuity" that helps fire spread from treetop to treetop. This can lead to a reduction in so-called "crown fires," said Collins. However, over a longer time scale of 10 to 15 years, the problem becomes the presence of lots of dead trees that have fallen to the ground. "So the whole trunks are on the ground, and then you have a completely different fire potential. That's potential for 'mass fires, fires that really can create sort of interactions with the atmosphere, and they really are explosive types of fires," said Collins. These are "eruptive and unpredictable" blazes that will be altogether new. This kind of fire may not spread in a linear fashion via the tree tops but rather on the ground through embers and pockets of dead fuel. This is "not a type of fire spread that we're used to. We can't even handle it in our models," said Collins. 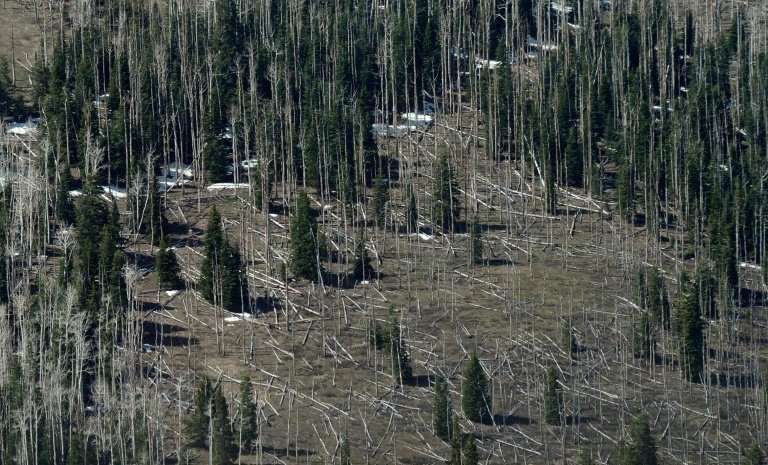 Tree mortality is mainly the result of a vicious cycle involving climate change, which ravages vegetation through repeated episodes of drought. The result is that trees are more vulnerable to pests such as the mountain pine beetle that is killing trees all along the west coast of the US and Canada by laying its larvae under the bark. But aside from these problems, US forests were not in good shape to begin with, said Collins, who blamed poor management. He criticized in particular what he called the bad habit of trying to put out every fire at all cost, a practice which leads to unsustainable tree density in forests. Some fires should just be allowed to burn. "That can do some cleaning in the forests that won't kill all the trees," said Collins, likening this to natural regulation. Others involved in managing forest fires also seek improved management. Last year, the US Forest Service said it would step up efforts to thin out overly dense forests so they are healthy and better able to survive fire. Last year fire management alone consumed 56 percent of the Forest Service's national budget. "As fire suppression costs continue to grow as a percentage of the USDA Forest Service's budget, funding is shrinking for non-fire programs that protect watersheds and restore forests, making them more resilient to wildfire and drought," the service said in a report.